Ok I have to start off by saying I am so so jealous that there were not products available for pet owners when I was a bit younger, that we have available now. I used to live in an apartment way back when I first moved out on my own. I lived on the 3rd floor and of course still had to have my pets. It was a huge pain in the a$$ to constantly have to take the dog we had outside especially when she was a puppy. Middle of the night trips and during the winter were terribly annoying. Although, I do not have to worry about that now having my own home and yard, my parents do. My parents now have a Teacup Yorkie who is beyond tiny. She is definitely not able to go out in the Michigan winter weather as she could get lost or worse extremely sick. Because of the extreme care needed for this dog, they have set up several "stations" for her with puppy pads to do her business. What a lot of people don't realize is that using puppy pads as frequently as this, can be extremely wasteful and harmful to the environment. The underlying plastic isn't good for our landfills as it is likely to be there for decades since it won't break down like any other plastics. With all this being said I was pretty interested in the brand Doggie Lawn - a Lawn Subscription Service. 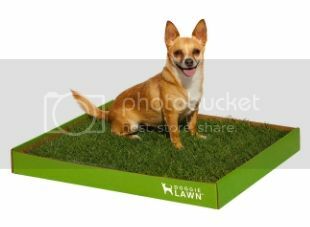 "DoggieLawn provides an easy way for owners to allow their dogs access to a bathroom, yet it doesn't require all the extra work that other pet potty boxes require (weekly washing of the artificial grass, emptying out the catch pan daily, etc) or have the smell that is often associated with them." I was really curios about the entire idea of having literally a patch of lawn delivered to my house. Being such an eco-enthusiast, I wanted to see how delivering real grass a few times a month would actually help both the environment and my parent's dog. Upon arrival we opened the box to find literally a cut patch of lawn. We even let this sit in the box for a day before taking it my parents and noticed that no moisture leaked through the outside of the box. Tinkerbell (my parents pup), is completely pad trained, so switching over to the lawn proved to be a bit of the challenge. She was quite confused and even a little afraid of it at first. However, my sisters (larger yorkie) who had been outside quite a bit as a pup, seemed very interested in this. Even the larger dogs thought it was fine and one actually attempted using it of course to mark his territory. Each time someone went potty, there was no leaks to clean up and the poop was just as easy as picking it up outside. My father has even noticed that with adding a small amount of water (spritzing) keeps the grass growing and healthy just like any other living plant. 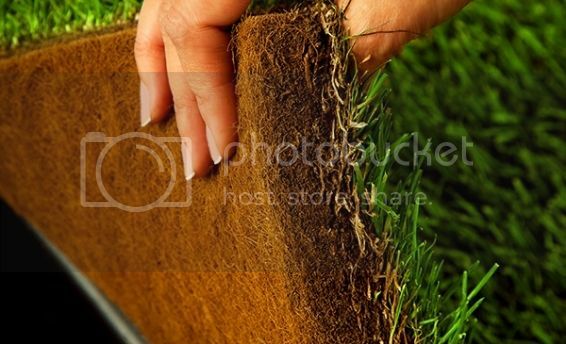 "The grass weighs slightly more than one half as much as standard sod for easy lifting and is "soil-less" which means it contains none of the dirt you find in sod sold in home improvement stores." Because of the soil-less design this makes cleanup and maintenance extremely simple. When you are done, you simply throw away the grass in the box it arrived in and begin using another (which of course is auto-shipped. 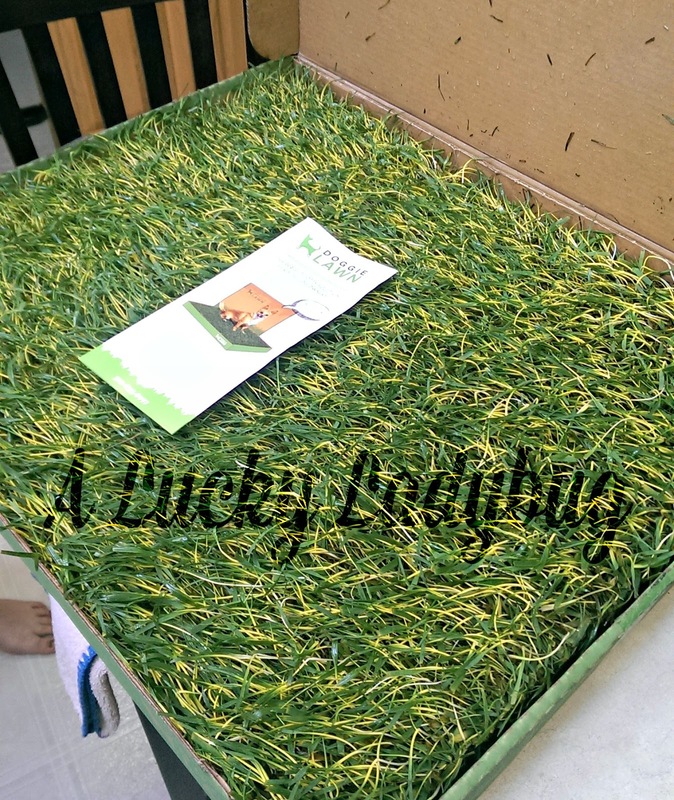 The box and grass are biodegradable and/or recyclable. My only concern is the shipping costs even at a lighter weight which we know contribute to polluting our planet. I think trying to stretch the life by spritzing the grass will help minimize the effect you can have even more using this environmentally friendly product. Recommendation: I do think this is an expensive product but again you can lengthen the time it can be used for as well as are saving the money you spend on the puppy pads which aren't cheap either. Again I wish there was something like this available for me when I was in the apartment and definitely recommend for someone with a teacup dog OR living somewhere without a yard. 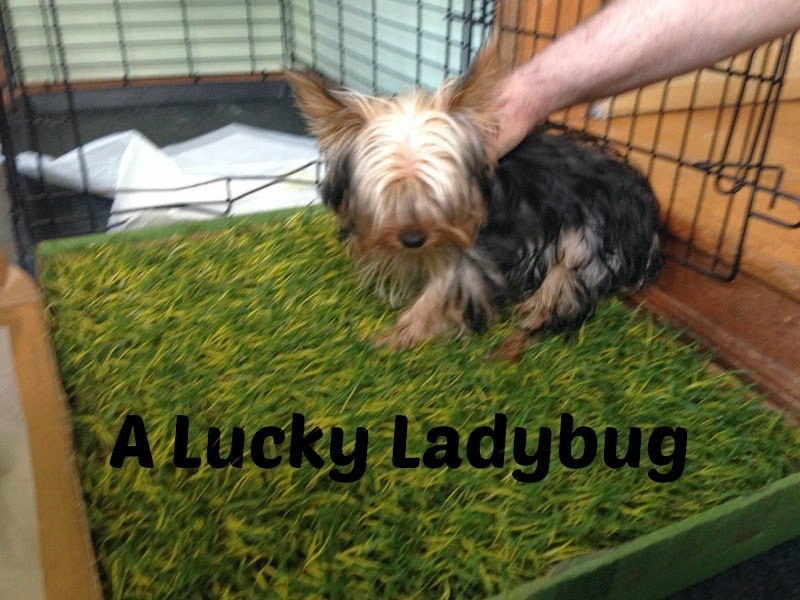 Giveaway: Doggie Lawn is going to give one of A Lucky Ladybug's lucky readers a standard size Doggie Lawn Delivery to try of their own! This giveaway starts 5/12 so come back and enter for your chance to win!! I would love to get the Doggie Lawn for my brother and his wife. They just got a new puppy that they are trying to train. 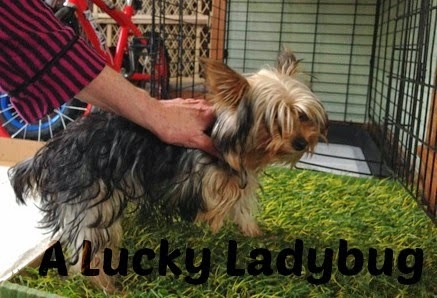 It is a small dog and I think using something like the Doggie Lawn would be a good option for them. I am most excited about the Doggie Lawn. I have 3 dogs (2 are pups). I have an area in the back yard that is hooked to my house, but does NOT have grass in it and the babies can't seem to "do their business" because there is NO grass. This would be a dream come true. Hoping to win! I am interested in this for my oldest sheltie....I have eight dogs, three of which are rescues.... My oldest girl often wakes me up in the middle of the night as she needs to pee and I'm interested in this to give her an inside alternative in the middle of the night or when I have to leave her at home for a few hours so she doesn't have to hold it. Since it's real grass I think she would actually use it and if she would It's something I'd be interested in keeping around all the time for her, since she would not be using it all the time, I'd try to extend the life of it by sprit zing it to keep it alive to last longer.... My old girl will not even consider those artificial turf doggie indoor potty things but this might work for her....thanks for the great review. I'd really like to try this out for her.